Immediately following a panel discussion on sexual and gender-based misconduct awareness and prevention in the performing arts, Strength & Sensitivity and Carla Dirlikov Canales of The Canales Project presented a truly fascinating performance. Strength and Sensitivity is “a multimedia concert experience that blends contemporary music, poetry readings, and audience interaction to catalyze dialogue on themes of gender Dynamics, intersectional feminism, and empathy,” and their performance expounded on the themes discussed during the panel. One of the most thought-provoking works was Improvisation by Colleen Bernstein on piano. As she relayed to the audience, in the aftermath of one of the Michigan Daily articles concerning sexual misconduct and people associated with the School of Music, Theatre & Dance, Colleen Bernstein sat down at the piano, opened a voice memo on her phone, and improvised at the piano to try to make sense of what she was feeling. This recording was played through the sound system in Hankinson Rehearsal Hall on Tuesday night. For the duration of Improvisation, interactive questions appeared on a screen behind the stage, and audience members could text responses to a given number. Question included “What does this community need to do to make progress towards gender equality?” and “Describe how you feel right now in one word.” As I sat and watched the responses fill the screen, changing in size according to how many people had submitted that same word, I could hear hope, grief, and a sense of tranquility permeating the music. I especially appreciated that even the performance was continuing the dialogue that had been started. The second part of the performance was presented by Carla Dirlikov Canales of The Canales Project. An SMTD graduate and acclaimed opera singer, Ms. Canales started Hear Her Song as an initiative that honors “distinguished women leaders through new songs inspired by their words, written by leading female songwriters and composers.” The project has commissioned over 40 songs to date. Ms. Canales’s performance was, without question, my favorite of the evening. My only disappointment was that due to time constraints, she was able to perform only three of the five programmed songs (how I would have loved to hear “This is What” in honor of Supreme Court Justice Sonia Sotomayor, or “What Greatness is Possible” for Jennie Boelkens!). She sang “Foster Love,” a song honoring Lynn Price, who has dedicated her life to reuniting siblings separated by foster care, and “Mercy,” honoring Sister Marilyn Lacey, founder of Mercy Beyond Borders. She then closed with the organization’s theme song, “Hear Our Song” by Katie Pfaffl. Although the audience at that point had dwindled to only about 30 people, the energy was palpable as Ms. Canales’s voice soared to the hummable, empowering anthem. In fact, she will perform that song later this month at the United Nations in celebration of International Women’s Day, which is March 8. It was an uplifting conclusion to an evening of hard conversation. 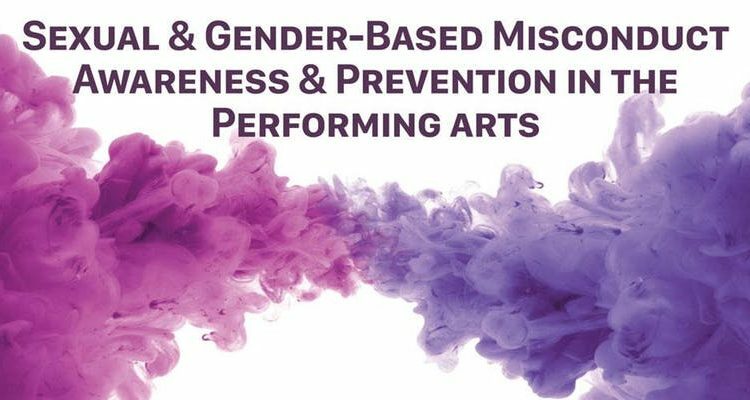 Tuesday’s performance on the theme “Sexual and Gender-Based Misconduct Awareness and Prevention in the Performing Arts” has given me hope that together, we can address the issues that need to be addressed.